Ever been to a restaurant in search of tuna, but not able to recognize it as it isn't labelled "tuna." This post will introduce you to all the different restaurant names the food industry calls tuna, and why! 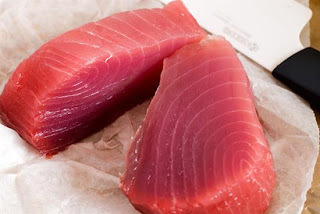 I will tell you a bit about the differences that you can enjoy tuna often! - Tuna are fast swimmers, some have speeds up to 70 km/hour! There are over 40 members of the Scormbridae family, which is often referred to as tuna, BUT this family does include types of mackerel and bonito (which is why tuna is sometimes labelled bonito on a menu). 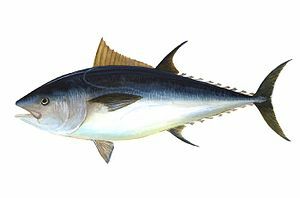 Albacore: the only tuna to be marked as "white meat tuna"
Atlantic Bluefin: can reach up to 990lb in weight!